The 2020 Census — a once-a-decade effort by the federal government to count every person in the U.S. — is still three years away, but recent developments at the Census Bureau have raised concerns about the accuracy of the upcoming count. The agency recently received $164 million less than what it requested from Congress in the 2017 fiscal year, despite a traditional jump in funding for critical preparation in the years leading up to the nationwide count. The Trump administration's proposed 2018 budget doesn't give it much more. And in May, Census Bureau Director John Thompson announced he would resign at the end of June, leaving a major gap in leadership at a critical time. Meanwhile, the U.S. Government Accountability Office has put the 2020 Census on its "High Risk List," as it did the 2000 and 2010 Census, and cited the Bureau's failure to implement strategies and technologies to cut Census costs, which hit a record $12.3 billion in 2010. "Over the past 3 years, we have made 30 recommendations to help the Bureau design and implement a more cost-effective census for 2020," the GAO observed; "however, only 6 of them had been fully implemented as of January 2017." This information is used to apportion the seats of the U.S. House of Representatives; realign the boundaries of the legislative districts of each state; allocate billions of dollars in federal financial assistance; and provide social, demographic, and economic profiles of the nation's people to guide policy decisions at each level of government. These developments have critical implications for the future of the South, which is home to significant populations of groups that have historically been undercounted. They include African Americans, Hispanics, low-income households, renters, children under the age of 5 and people facing language barriers. Census watchers and social justice advocates warn that under-preparation by the Census Bureau now risks undercounting these communities in 2020 — and consequently shortchanging already-vulnerable groups of political power, government funding, civil rights enforcement and other vital resources distributed based on population numbers. That could have far-reaching consequences for the South, according to Erin Hustings, legislative counsel for the NALEO Education Fund, a group that works to increase political participation among Latinos. "If historically undercounted populations are missed in significant numbers in 2020, that fact will impair the pursuit of greater equity in the South for at least the following decade," Hustings told Facing South. Not all demographic groups are equally likely to be counted in the Census, and for various reasons the South is particularly vulnerable to being undercounted. For one, the region is home to large and growing numbers of African Americans and Hispanics, two groups that have historically been undercounted in the past. After the 2010 Census, the Bureau reported that it missed 2.1 percent of African Americans and 1.5 percent of Hispanics, a total of 1.5 million people nationwide. Such undercounting has important implications for the South*, which is home to 49 percent of African Americans and 35 percent of Hispanics in the country, according to a Facing South analysis of 2015 demographic data. By comparison, the 2010 Census overcounted non-Hispanic whites by 0.84 percent. Then-Bureau Director Robert Groves attributed the disparities to how likely those groups were to rent versus own a home. "While the overall coverage of the census was exemplary, the traditional hard-to-count groups, like renters, were counted less well," Groves said in a statement in 2012. "Because ethnic and racial minorities disproportionately live in hard-to-count circumstances, they too were undercounted relative to the majority population." "With Latinos now the nation's second-largest population group, if you don't get the count of Latinos correct, you have a failed census." These and other factors contribute to the South being less likely to be fully counted in Census tallies. The Bureau's analysis of the 2010 Census found that the South was undercounted by 0.46 percent, while the Midwest and the Northeast were slightly overcounted. (The Bureau uses a more expansive definition of the South than Facing South does, also including Delaware, Maryland, Oklahoma, and Washington, D.C.) The region's biggest undercounts were in Florida, Georgia, North Carolina, South Carolina and Virginia, although they were within the margin of error there and in the South as a whole . A post-2000 analysis commissioned by the U.S. Census Monitoring Board, a body created by Congress in 1997, also pointed to problems with undercounting in the South. "Of the estimated 3.3 million U.S. residents not counted in 2000, 39% were in Southern states," Facing South publisher Chris Kromm wrote in an analysis of Southern states based on the board's findings. "In other words, nearly two out of five of the 'missing' residents were in the South." Advocates are also sounding alarms that certain groups will be at higher risk for undercounting in 2020 because of Trump administration immigration policies, which they worry will depress responses from immigrants concerned that their information will be shared with other federal agencies. A less than full count of Asian, Latino and other immigrant communities will hurt their ability to receive their full share of services, funding and political representation and jeopardize the accuracy of the entire Census. "With Latinos now the nation's second-largest population group, if you don't get the count of Latinos correct, you have a failed census," said Arturo Vargas, president of the NALEO Education Fund. Advocates who are encouraging immigrant communities to participate in the Census note that the survey does not ask for immigration status and that employees of the Bureau are barred by law from sharing individual responses with any other department. Violations carry fines of up to $250,000 or up to five years in prison. In addition, many LGBT advocates are frustrated with the Bureau's decision not to ask about sexual orientation in the upcoming Census. An initial draft of the Census survey included questions about LGBT identity for the first time, but that question was walked back by the Bureau, which said it was an error in the released draft. Advocates say that the lack of data will hurt their fight for equality. Research by the Williams Institute at UCLA has found that 35 percent of LGBT people in the U.S. live in the South and that they are more racially and ethnically diverse and more likely to face economic instability than non-LGBT people in the region. Inaccurate counts are potential social and economic disasters considering the many critical decisions driven by Census data, including drawing political lines, allocating government funding and investing in businesses and infrastructure. The South has amassed greater political power in recent years as Census-based congressional reapportionments have resulted in an increased number of congressional seats and Electoral College votes in several states in the region. After the 2000 Census, the South gained six congressional seats, and then another seven after 2010. Fast-growing Texas, Florida, and North Carolina are projected to gain seats after 2020, while slow-growing Alabama and West Virginia are expected to each lose a seat. Should anything go awry with the 2020 count, it could have political implications affecting how voting districts are drawn or how language minorities can access the ballot. "If the decennial Census undercounts African Americans, for example, then legislative districts may be drawn on its basis that unwittingly pack concentrations of African-American voters into smaller numbers of districts and that limit African Americans' potential influence in other districts," explained Hurstings of the NALEO Education Fund. Undercounting adults who are not yet fluent in English could also threaten the voting rights of language minorities, Hurstings added. That's because jurisdictions that are required to provide language access accommodations under the Voting Rights Act are determined by Census data showing where language minorities are concentrated. Important funding decisions are also driven by Census data. Nationwide, nearly $600 billion in federal funding is allocated to states based on Census numbers, according to a recent report by the George Washington Institute of Public Policy. Southern states receive $179.2 billion of that total. Populous states in the region like Texas and Florida receive the largest amount of Census-based funding at $43.3 billion and $29.3 billion, respectively. But smaller, more rural states like West Virginia and Arkansas receive the highest per capita funding at $2,755 and $2,542 per person. Many of these dollars flow to states through social safety net programs like Medicaid, Medicare and the Supplemental Nutrition Assistance Program, making their proper apportionment a matter of life and death for many people. 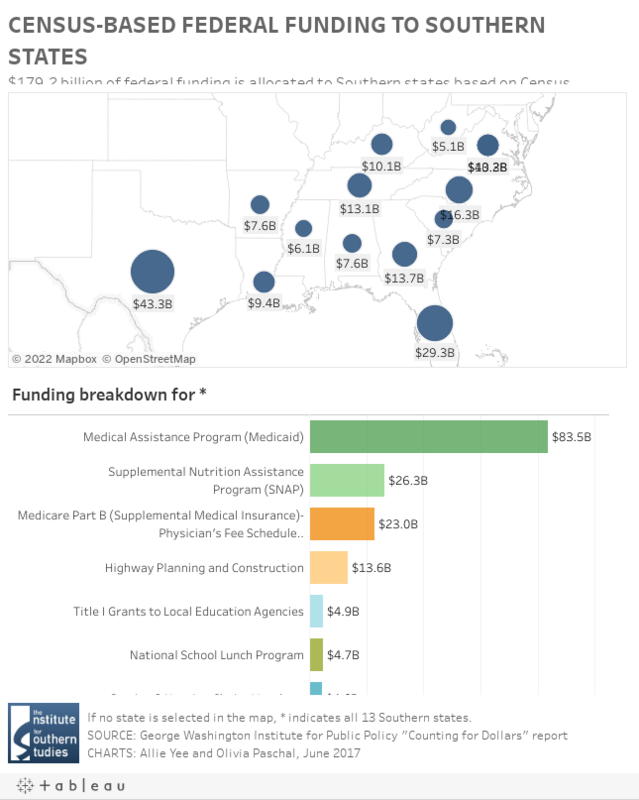 The interactive chart below shows a state-by-state and program-by-program breakdown of federal funds that are distributed to the region based on Census figures. The Census Bureau is navigating rough terrain in Washington as it tries to prepare for 2020 with limited funding. Reporting to Congress on his agency's activities in May, Census Bureau Director John Thompson walked a fine line of expressing confidence in preparations while acknowledging the challenges caused by less-than-expected funding. In his written testimony, he noted that the Bureau has had to reduce testing of new strategies to be deployed in 2020 and delay the opening of regional offices, among other setbacks. "These changes were necessary to ensure that we remain on the critical path to systems and operational readiness for the 2020 Census," Thompson said. "As we continue to ramp up to 2020, maintaining adequate funding levels is paramount to remaining on this path to ensure the complete development and integration of the systems and operations required for a successful census." Meanwhile, states and nongovernmental organizations are moving forward at the local level to ensure as accurate a count of their communities as possible. "What really makes a difference is to have a trusted local face to tell their friends and neighbors why it's important to fill out the Census." In North Carolina, Bob Coats, Gov. Roy Cooper's Census liaison at the Office of State Budget and Management, is working with local officials to verify residential addresses while encouraging them to begin planning and budgeting for Census outreach. Though the Census has plans to encourage participation nationally, Coats said that local outreach by people who know their community is vital. "How the Census promotion happens in the city of Durham or Winston-Salem or rural North Carolina could look very different from that national campaign," he said. Coats is encouraging localities to create Census Complete Count Committees of local leaders, nonprofits, businesses and other organizations to reach out to groups at risk of being undercounted. The Census Bureau has also created a Planning Database of local demographic details to help identify areas of "hard to count" groups in order to target outreach. "What really makes a difference is to have a trusted local face to tell their friends and neighbors why it's important to fill out the Census," Coats said. The Census Bureau has set up partnerships with governor-appointed liaisons in every state and has regional offices to help facilitate Census operations at the state and local level. The Atlanta regional office includes Alabama, Florida, Georgia, Louisiana, Mississippi, North Carolina and South Carolina, while Kentucky, Tennessee, Virginia and West Virginia are under the Philadelphia regional office. The nonprofit sector is also stepping up to spread the word about the importance of adequate Census funding and full participation. For example, nonprofits like the NALEO Education Fund and the Leadership Conference on Civil and Human Rights have put out fact sheets and statements on the importance and potential impacts of the Census on the country and in specific states. Coalitions of foundations like the Funders Committee for Civic Participation, Grantmakers Concerned about Immigrants and Refugees and the Forum of Regional Associations of Grantmakers are encouraging funders to support Census engagement efforts. In May, the Michigan-based W.K. Kellogg Foundation released a statement with 12 grantee organizations emphasizing the importance of an accurate Census to advancing racial equity. As part of that statement, Heather McGhee, president of the national think tank Demos, emphasized that the Census is about much more than just a national headcount. "It is a question of whether we want to guarantee fair representation. It is a question of whether we want to ensure that every American has access to equal opportunities, no matter the color of her skin," McGhee said. "These are values that stand at the core of our American identity — and for that reason, we all must call upon President Trump and Congress to ensure that the Census can take place in 2020 without issue." * The Institute for Southern Studies counts these 13 states as part of the South: Alabama, Arkansas, Florida, Georgia, Kentucky, Louisiana, Mississippi, North Carolina, South Carolina, Tennessee, Texas, Virginia and West Virginia. Olivia Paschal and Jordan Wilkie contributed research for this story.